Polyphony Digital is re-releasing their PS3 racer Gran Turismo 5 later this month. 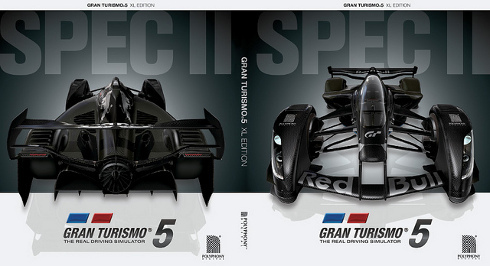 Gran Turismo 5 XL Edition will arrive on January 17th and cost $39.99. 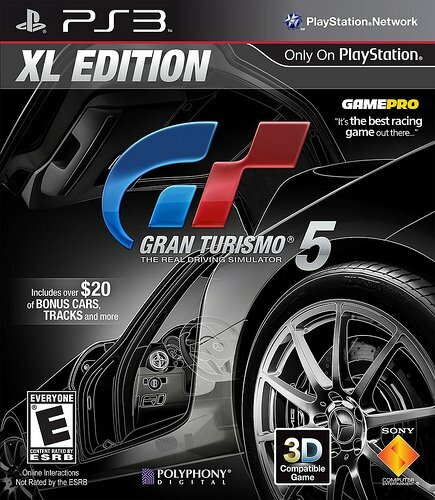 The XL Edition of GT5 features all of the additions and improvements released for the game through free updates. All of the updates through Spec 2.0 are included on the disc. You'll also get a voucher for more than $20 of premium DLC, including the Racing Car Pack, Car Pack 2, Course Pack, Racing Gear Pack, and Paint Pack. The base game is pretty huge by itself. GT5 shipped with over 1,000 cars and 26 locations. Some of the other features include a Course Maker, stereoscopic 3D, and damage modeling. The XL Edition's package has a reversible coversheet. One side of the coversheet has a picture of the Red Bull X2011 supercar. The box art is below.